style drinks. You can even use beer on beer if you don’t want it to get that bad. 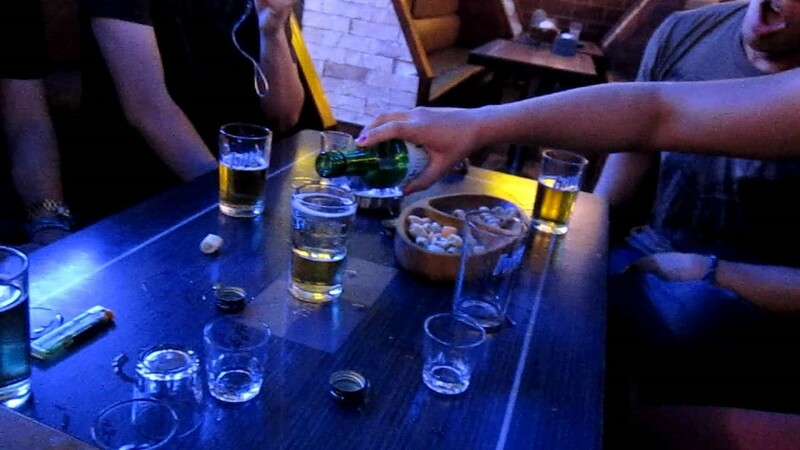 The thing is to float an empty shot glass then each player takes turns slowly pouring the alcohol into the shot. The player who sinks the shot glass chugs the Boilermaker or jäger bomb, or what have you. This one is fun and can get ugly fast. This is a game for a bigger group at least 4 or more players. Drinks should be beer, as you have to drink while thinking. Mixed drinks will get you fucked up fast. In the game, you just have to name famous people, actors, singers, athletes, politicians, characters from books or movies, etc. The basic rule is at least 3 people have to have heard of them. Once a name is said that name can’t be used again. When the person who starts he or she gets free range to name anyone. Example: Arnold Schwarzenegger. The next player must start with the last name of the famous person. Example: Selma Blair. The Next player would start with a famous person that starts with B. You must drink the whole time. Now if a person uses a name with two of the same letters for a first and last name like Susan Sarandon, the game then changes the direction of the flow. Single word names like Bono, Madonna, Cher, allow that player to choose someone the chug their drink. This one if fun, and sometimes battle ensues between two people using double letters to bounce back and forth from each other. Fuzzy Duck is a drinking game where players usually sit in a circle around a table. Players take turns saying “fuzzy duck”. Any player can choose to say “does he?” Which reverses the direction. Once the direction is reversed the players must say “ducky fuzz” again until someone says “does he?” which will again reverse the direction of play and players must then say “fuzzy duck” again. If someone messes up the saying he or she must drink. It’s an easy enough game, fun to play and funny to hear the messed up saying. Quarters is the name of a game most people in America are familiar with. It’s a game if two starts at a bar table, random people may just come up and ask to play. It’s a great way to meet new people. Rules are simple, have a shot glass and a beer or drink. You get one chance to bounce the quarter into a shot glass. If you miss you drink then pass it to the person to your left. If you get it in you pick someone to drink. Then you go again until you miss. If you get five in a row you make a rule. Examples of rules are no pointing with your finger, speak in an accent, non-dominant hand drinking, etc. There are many variations of the game, some variations have a beer in a glass and you have to bounce it in the glass. Drinkquizition, Yup you got us, we are plugging our drinking game on our blog. The game of Drinkquizition is small and very portable. The cards can take a beating and a few spills of beer. Beyond being easy to bring into a bar, it’s a fun game that will draw the attention of others to what you’re playing. Drinkquizition is a game of wits using trivia and common knowledge whilst under the influence of alcohol, resulting in laughter, friendships, and inebriated fun. Pick up a copy here.